Excursiones y tours archivos | Basilea. Guía de viajes y turismo. Excursiones y tours en Basilea. En esta página vas a poder encontrar todo tipo de excursiones por la ciudad helvética y sus alrededores. Desde paseos por el centro histórico de la ciudad a viajes de varios días por los alrededores y otras ciudades del país. Nos permitirá de esta forma conocer mejor Suiza y todos sus encantos, tanto naturales como urbanos. 4-Hour Zurich City Tour from Basel with Private Guide. Spend a half day in Zurich with your private tour guide. Your walking tour will give you a complete overview of the spots of the inner city center. 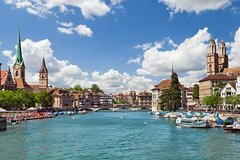 Your tourguide will show you the Zurich main station, Bahnhofstrasse, Paradeplatz, opera house, the lake shore, old town, Lindenhof, great minster church, Chagall designed church windows, university building, terraces of university and a boat ride on the Limmat river (Mai-October). 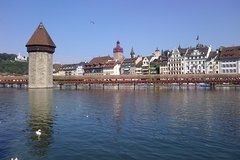 4-hour Lucerne City Tour with Private Guide Including Boat Trip on Lake Lucerne from Basel. Spend a half-day in Lucerne with your private tour guide, just you and your guide! Together with your tour guide you will discover the old town of Luzern, the wooden “Chapel bridge”, the lion monument and the magnificant churches in the city. Your tourguide will tell you stories about the city and the life in Luzern. Close your tour by travelling with your tourguide on the scenic boat on lake Luzern and enjoy the view to the lake, the city and the surrounding mountains. Basel Like a Local: Customized Private Tour. Get to know the city through the eyes of a passionate local. With no set itinerary, you can customize the tour or leave it up to the local for an insightful introduction to the city. Make travel about the people you meet not just the places you see. Duración: 2 to 6 hrs. Mount Rigi tour & lake boat cruise with private tourguide – starts from Basel. Spend a day around Lucerne and on Mount Rigi with your private tour guide, just you and your guide! 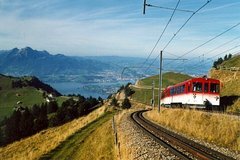 Enjoy a one-hour boat trip from Lucerne to Vitznau and then climb up to Mount Rigi on cogwheel railway. Enjoy fantastic views over Lucerne, the lake and the surrounding Alpine mountain peaks. Relax on the summit terrace before beginning your return journey. Descend by cogwheel railway on the east side down to Arth-Goldau and take a short train ride back to Lucerne. Private transport to or from Basel Mulhouse airport. Enjoy a transfer from Strasbourg and its surroundings to Bale Mulhouse airport, without waiting and without constraints. Our drivers can wait for you at the desired location (hotel, airport or Strasbourg station or accommodation) to drop you off at Bale Mulhouse. We can also pick you up at Bale Mulhouse airport to take you back to Strasbourg and its surroundings. Our vehicles have several options to ensure optimum comfort . Categoría: Traslados y transporte terrestre. Duración: 90 to 120 mins. 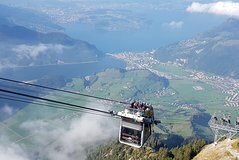 Mount Stanserhorn from Basel – cabrio gondola ride – with private tourguide. Visit Mount Stanserhorn in central Switzerland with your private tourguide. Ride on a historical funicular and on the world’s first and only one cabrio gondola to the top. Enjoy a 360 degrees panaroma view during your ride on the 2-deck-gondola. On top, at 1900m above sea level, enjoy stunning views over Lucerne, the lake Lucerne and the surrounding mountains. Take your time at the revolving restourant, at the terraces and visit the marmots next to the summit. Categoría: Cruceros, vela y tours acuáticos. 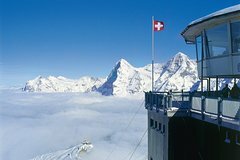 Mount Titlis day tour with private tourguide – starts from Basel. Spend a day at Mount Titlis with your private tourguide. Travel by train from Basel via Luzern within two hours to Engelberg. 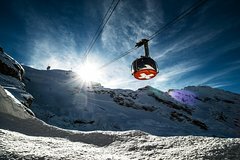 From there on, take the scenic gondola, which takes you up to Mount Titlis. With your tourguide you discover the highest suspension bridge in Europe, the ice cave and enjoy the fantastic aerial view from the terraces to the glaciers surrounding. Schilthorn – 007-James Bond world – with private tourguide – starts from Basel. Spend a day in the Lauterbrunnen valley and in the middle of the Bernese Alps. Visit on a spectacular roundtrip by train, cable car and railway the area of Lauterbrunnen, Mürren and Schilthorn. Toghether with your private tourguide, you will discover the summit and enjoy the fantastic aerial view which spans from the Titlis, Jungfrau, Mönch, Eiger, over the Bernese Alps and the Jura mountains up to the Vosges Mountains and the Black Forest. Mont Blanc is also just visible. Stay relaxed at the panoramic revolving restaurant at the summit, Piz Gloria, was featured in the 1969 James Bond movie On Her Majesty’s Secret Service. Visit the exhibition about the movie and get nervous, when passing the “James Bond thrill walk” on the way to the summit. Basel city tour – 4 hours – with private tour guide. Spend a half day in Basel, known “as Switzerland’s capital of cultutre, conference location and university city” with your private tour guide. Your walking tour will give you a complete overview of the spots of the city center. Your tourguide will show you the the “Kleinbasel” district, where you have a stunnting view to the Rhine river and the cathedral. Crossing the rhine river by ferry and walk along the old town buildings at “Grossbasel”, narrow alleyways and hidden squares to the beautiful city hall. Get informations from a local guide about the life, the culture, museums and the history of this fantastic town. Zermatt & Gornergrat (Matterhorn)-day tour with private tourguide – from Basel. Visit the mountain resort village of Zermatt and the Alps mountain, Mount Matterhorn, on this private, 8-hour sightseeing tour. Enjoy a walk around and through the village and ride to Mount Gornergrat to enjoy stunning views of Matterhorn. Relax on the summit terrace before beginning the return journey. Descend towards Zermatt and visit the museum, which explains the story about the tragedy of the first summit climb of Mount Matterhorn.